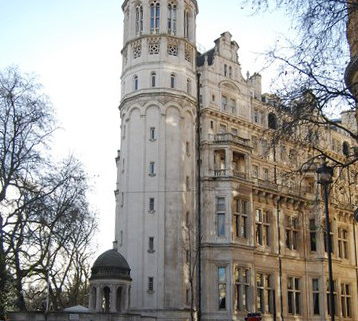 From the very first day of its launch by Gladstone in 1882, the National Liberal Club was the first ‘Gentlemen’s club’ to admit women as full members on an equal footing. Today it goes further being the first (and so far, the only) club to recognise all couples and of all genders. The building we see today was the result of a design competition for a new club. It was a challenging project: the site was an oddly-shaped plot of land – an asymmetrical triangle by the river and just off Whitehall. The winner was noted Victorian architect Alfred Waterhouse – best known for the Natural History Museum and Manchester’s Town Hall. Waterhouse created a masterpiece of design, blending old and new and combining Italianate and French Classical Revival elements. He also designed many of the details right down to the fireplaces, the dining room chairs and various fixtures and fittings. Once inside, visitors cannot avoid noticing the innovative geometrical patterns across the rooms, all revolving around an oval staircase, to conceal just how unusual the club’s shape is. 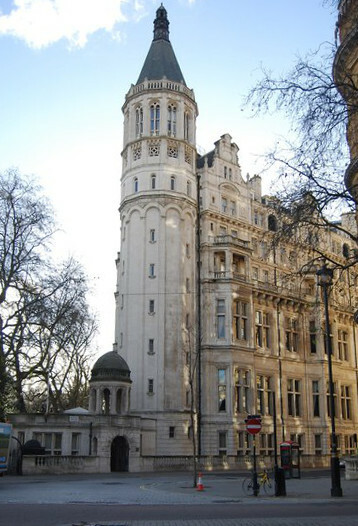 Waterhouse also embraced cutting-edge technology telegraph wires, freshly-printed newspapers arriving by steam train, London’s first ever lift, and London’s first building to be fitted with electrical lighting. 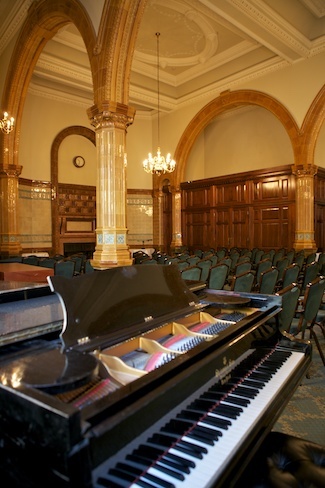 Coffee Concert by the Thames will be staged in the David Lloyd George Room – one of the largest and most dramatic rooms in the club. This one-hour recital performed by a talented all-Australian trio will feature an programme of music by Australian composers Horace Keats, Brennan Keats, Don Banks and Wendy Hiscocks alongside music by British composers Rebecca Clarke and the much loved Ralph Vaughan Williams.